As a wry look at how eastern philosophy has influenced western subculture, this feature film debut from music director Paul Hunter works quite well. It comes unstuck, however, because of its silly story and distracting editing, not to mention an overload of CGI and wire fu. After two decades of relatively straight roles, Chow Yun-fat can afford to ham it up a little. 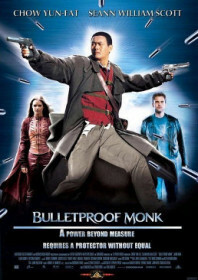 He does so as a heroic Tibetan monk with more than just bulletproof credentials. He is safeguarding an ancient scroll which can suspend time and bestow superhuman strength. Young scoundrel Seann William Scott (Stiffler from American Pie) is regarded to be his successor – which in itself is quite strange – so he buddies up with punk princess Jaime King to retrieve the scroll when a power-crazy Nazi tries to steal it. Although it’s based on a comic book, there is still a cash-in feel to this lacklustre action fantasy, particularly in the wake of successful genre-bending kung fu hits in the west like The Matrix and Crouching Tiger, Hidden Dragon. Where it does work – more surprisingly – is in the chemistry between Scott and Chow Yun-fat, which does produce some nice comedic moments.